Navaratna Bandara-Mahaweli Systems Group corr. 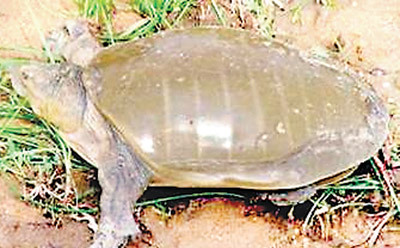 Four men from Kurunegala were arrested for trying to sell turtle meat at Pamburana area off Sungavila near the border of Somawathiya National Park on Tuesday. They have been apprehended by the local Wildlife Conservation Department officials while carrying flap shell turtle meat, along with doormats that they had been selling. They had allegedly killed about 14 flap shell turtles to obtain meat. Officials also discovered remains of turtles. The culprits are to be brought before the Polonnaruwa Court along with the meat seized.